There's a lot to like about Northern California’s Largest Water Park! Whether you are visiting for your first time or your 50th, we've got your ticket to summer fun! Kids 2 years and under are free and do not need a ticket or season pass for park entry. 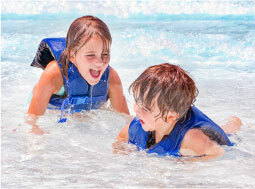 Raging Waters San Jose is the best place to go for endless summer fun! As Northern California's premier waterpark, there are tons of rides and slides, fun for the whole family. Raging Waters gives special family discounts on water park tickets on select days throughout the summer. For those visiting with groups of 15 or more, special group sales water park ticket price discount. Plan your family's next visit when Raging Waters is hosting one of their many family-friendly events. Starting at $33.99 when you purchase 4 Days in Advance Online! When you purchase at the Gate!